May 1993 Reported [here]. An estimated one million people gathered in a small Philippine town north of Manila on 6 March to witness a visitation of the Virgin Mary. Many people in the crowd, including top Philippine government officials, journalists, and the local Catholic bishop - acting as a representative of the Pope - attested to seeing a silhouette resembling the Virgin Mary appear above a guava tree for approximately five seconds. This was followed several minutes later by flashes of red, yellow and blue lights moving towards a "dancing sun". The events took place at Apparition Hill in the small town of Agoo, in La Union province. A visionary boy, 16-year-old Judiel Nieva, says that the Virgin Mary has been appearing to him, and giving him messages, on the first Saturday of every month and on special religious feasts since 1989. The pilgrims gathered in Agoo on 6 March because the boy said the Virgin would appear at that particular place and time. About a month earlier, a statue of the Virgin Mary owned by Judial Nieva's family began regularly weeping tears of blood. The phenomenon was witnessed by thousands during a noontime mass in February.An assistant to the nationâs President said that the statue was brought before his critically ill wife on two occasions, and both times she unexpectedly recovered. There are also reports that Communion wafers turn to flesh and blood in Nievaâs mouth. 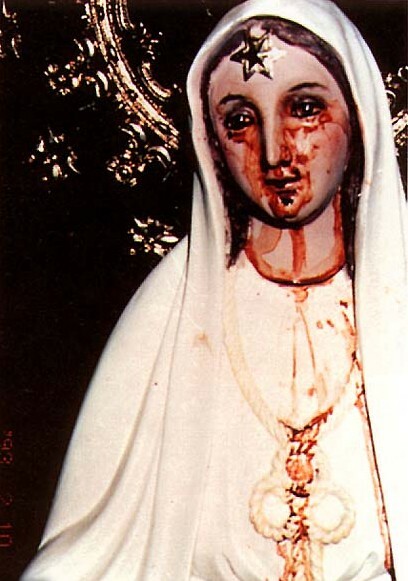 Another resident of the area said that his statue of the Virgin was also "shedding tears, which later turn blood red." On the day before the Virgin's visitation in Agoo, thousands of Marian devotees in the area witnessed the phenomenon of the "dancing sun". A Manila Bulletin reporter who was covering these events said he personally witnessed a "spinning and dancing of the sun for about 15 minutes." During an overnight vigil preceding the Agoo visitation, witnesses said that three bright stars appeared to be facing each other just below the Big Dipper constellation in the east. At dawn that day, the sun again "moved or danced" for a few seconds, witnesses said. On 6 March, with the huge crowd in attendance, Father Roger Cortez conducted a noontime mass at Apparition Hill. After Cortez appealed for silence from the crowd, and called for them to feel the presence of Christ in their hearts, a silhouette of the Virgin Mary appeared for a few seconds above a guava tree. Approximately 10 minutes later, when Judiel Nieva was reading a message that he had received from the Virgin Mary, "lights of different colours came from various directions and moved toward the sun," according to the Manila Bulletin. The young seer said that the Virgin Mary in her message asked Catholics to pray for the children of famine-wracked Somalia. Nieva said the next apparition would be on 8 September, and then "the Blessed Mother will disappear for ever." Top Philippine government officials, including the Speaker of the House and the Senate President Pro Tempore, attested to the manifestation in Agoo. A radio reporter, Mon Francisco, said over Manila radio station DZXL that he saw a silhouette of a woman wearing a dark waistband. 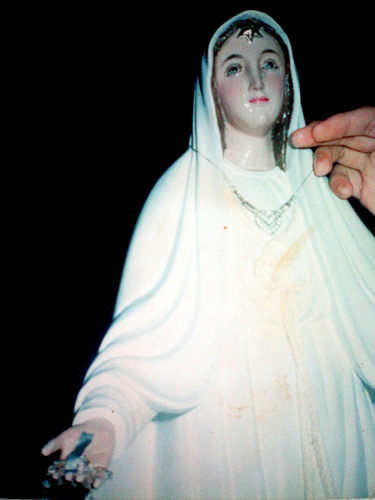 Francisco said he had not expected to see the apparition, and that he "was not hallucinating." Bishop Salvador Lazo, the province's Catholic bishop, also experienced the phenomenon and created a commission to investigate, gather evidence and testimonies, and report to the Vatican on the event.